I love white elephant parties, maybe because I have so much that's white elephant worthy in my home. I have a tendency to keep terrible and/or useless things because they are so terrible and so useless, even finding it hard to give them away as gag gifts. Last year I parted with part of a 99 cent Goodwill "Dorf" collection (only part because I cleverly wrapped two up as gifts to my husband, who has yet to watch all of it.) Imagine the Christmas joy felt by the elderly couple who left with both Dorf and a whoopee cushion under their arms. 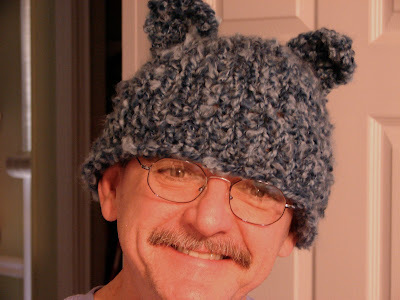 The Kittyhead hat was a last minute knit up that I made for a friend's white elephant party. Never would've thought I'd see a grown up fight it out in yankee swap for this cheap, fuzzy hat. Since then, my friend has seen the kittyhead driving around town, hunched over the steering wheel. The man who won it still wears it, under his hard hat, no less. This is my father-in-law wearing his own gift. But this year's gift is, by far, my favorite. I didn't know what I'd do with these when I found them in a stack of old records someone gave us, but I knew I couldn't just throw this away. I can't stop staring at this picture. I'm mezmorized by the quality of these photographs...the artwork... the platforms... the jazz hands! Who wouldn't want to wake on Christmas morning and find these under their tree?